On Saturday September 8, 2018, former Apache Alumnus Jimmy Butler was inducted into the TJC Sports Circle Of Honor, where he received a signature gold coat. Despite spending just one year in the school, Butler is widely regarded as one of Tyler Junior College’s most prominent basketball products of all time. He led the Apaches in scoring, with an average of 19 points per game. He went on to play for Marquette University and in 2011, he was picked 30th overall in the NBA draft by the Chicago Bulls. He is a four-time NBA All-Star and was named NBA Most Improved Player in 2015. The 2016 Olympic gold medalist was traded to the Minnesota Timberwolves in 2017 and averaged 22 points during his first season. TJC had an alumni game which featured Tyler Jefferson, Craig Jones, Justin Johnson, Ifeanyi Koggu, Mitch Marquis, Reggie Nelson, Kevis Shipman, Delbert Simpson, Cedric Smith, Theo White and Marcus Jackson. The Black team defeated the Gold Team, 67-65, behind White’s 25 point performance. While Nelson, a former John Tyler standout, led the Gold team with 20 points. The “Jimmy Butler TJC Promise Shootout” followed at halftime. It was presented by Citizens 1st Bank. Student representatives from public high schools that are currently participating in the TJC Promise Program competed. Butler helped provide some money to local school districts. The students took free throw and 3-point shots for a chance to win monetary prizes that would be dedicated to community scholarship funds. The endowments will provide TJC scholarships in perpetuity to the deserving students that have participated in the program. Tyler Lee’s Devin Johnson made four free throws and four 3-pointers to record the highest total of the event. Johnson along with John Tyler’s Darry Moore earned $22,000 for Tyler ISD. The other participants were Chapel Hill’s Chason Wright, Grand Salines Luke Fraim, Lindale’s Teigan Edwards, Van’s Austin Mithcell and Winona’s Dakota Pullum. 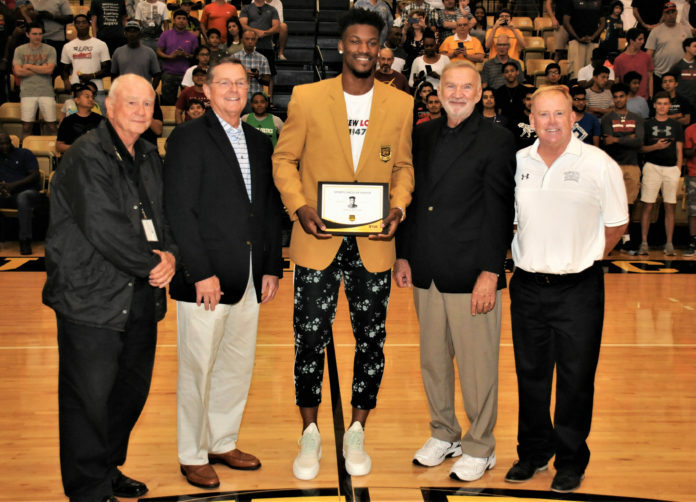 TJC named the Wagstaff Gymnasium’s Lobby after Butler, retired his jersey and Tyler city councilman John Nix named Sept. 8, 2018, as “Jimmy Butler Day” and presented Butler with a key to the city. “The love I have for this city. school, coaches, all the players I have played with and all the new guys this is where it all began for me. I’m grateful and thankful for everything, this is much more than I could ever imagined,” Butler said. I think it is very important to always recognized and award those who have done great! This is a great example. It’s awesome to see an all time TJC great to get recognized. That is so cool that Jimmy Butler would come to honor our small school. He is a phenomenal basketball player and a phenomenal player! I like how their representing TJC with a good inspiration.